A distinguishing hallmark of the American College Campus is its original historic and iconic campus core. Frequently, these core campus buildings become underutilized over time and begin to outlive their original vitality and purpose by housing functions that don’t appropriately utilize the existing structure. Old campus buildings are often not the primary focus of Higher Education institutions who face extreme competitive and financial pressures. Supplemented by the economic uptick with historically low financing costs, rival institutions in the “race to build” have focused limited resources on cutting edge buildings designed to attract students and faculty to compete for a diminishing student pool. Renovations and adaptive reuse of older buildings such as dormitories and underutilized administrative or academic buildings are considered a lower priority or “the second-best solution,” rather than the optimal strategy to position and market a campus. These older buildings, especially those built before WWII, are a hidden treasure for universities. 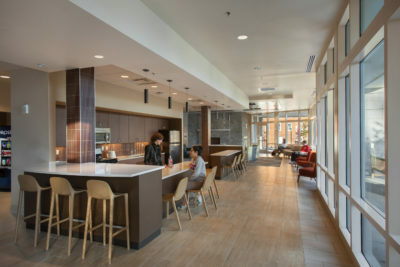 In many cases, they present a better value in furthering the institution’s mission by delivering “more for less.” The key to success in adapting or renovating an aging building into a student residence hall is in the evaluation of the existing building conditions. Realistically assessing the older building’s potential is essential because it allows the institution to identify distinguishing characteristics while clearly understanding the renovation challenges and building potential. 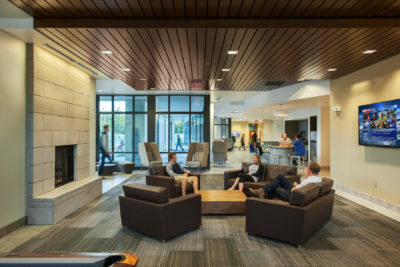 The fundamental benefit of renovating older campus buildings, especially for student life, is that it offers institutions the ability to create a positive impact on their bottom line. 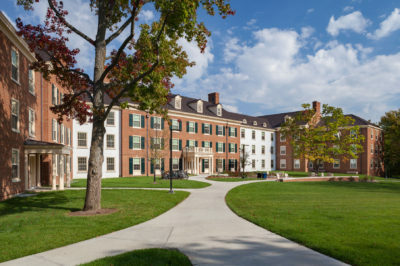 Renovations can be far more affordable capital projects and offer similar benefits to a new building, while displaying a greater level of character that is representative of the campus context. Furthermore, many of these historic buildings can facilitate the migration of student residence halls to larger, more comprehensive community spaces that serve as an extension of academic life and support the activities that are becoming central to student life. Renovating an older residence hall can cost $60 – $85K per bed, as opposed to $80 – $120K per bed to build new. Why such a difference? First and foremost, existing facilities are already sited and typically in an advantageous position on campus. The building structure and envelope (walls, roof) are in place, although the envelope usually requires repair. With the potential for 25-30% lower costs, this presents significant savings over a new facility. Coupled with the added benefit of having historic materials that are not affordable at today’s construction costs, renovations provide a distinct advantage to the institution. Moreover, by repurposing an existing building and preserving its value for another 20 to 30 years, an institution is bestowing one of the most “green” and environmentally sustainable gestures it can offer to its campus. Ultimately, the benefit of capitalizing on tradition and retaining the historic value of an institution is invaluable. Renovations also grant institutions the unique opportunity to update the building systems to include a more insulated envelope, efficient water distribution systems and heating, cooling and ventilation with greater fresh air distribution, as well as state of the art lighting and power systems that deliver a huge impact on energy consumption. During the planning and evaluation stage of the design process, universities can take advantage of the opportunity to assess if geothermal technologies are relevant. When all is said and done, this type of capital project can result in reduced energy consumption and upgraded life safety systems while creating a dramatic increase in space utilization at the center of campus for far less construction dollars. When performed by experienced design professionals, the evaluation and planning process can be conducted within a relatively short schedule and ultimately provide the institution with a realistic road map of how an older building could function. This insight empowers the institution to make an informed decision, confident of a renovation candidate’s viability as a new student residence. Acknowledge the recreational needs of this new cohort of students – group recreation spaces should be equipped appropriately (i.e. video games) and promote social interaction and resident hall identity. Create a cadence of group spaces throughout the building centered around things like music, a pool, ping pong, cards and other social games. Re-examine accessibility – needs that are usually unattainable in a small renovation can be a major initiative in creating an entirely accessible older building. Breakdown the walls between academic spaces and resident spaces to promote learning beyond the classroom. Create a combination of quiet study and small group study spaces. Even consider the possibility for evening lecture spaces. Thoughtfully consider potential incidental spaces throughout the building’s corridors for unplanned, organic student interaction and a breakdown of the sterile hallway. Select interior design finishes and furniture that is durable, aesthetically timeless and mature. Craft distinguishing characteristics that are unique to that building to create a visual sense of identity for the residents. 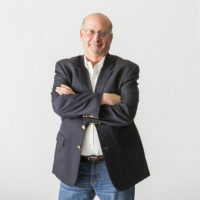 John’s work has been featured in state, national and international design journals and received recognition by the American Institute of Architects. He has taught planning and design at Syracuse University, the Boston Architectural College, the University of Pittsburgh and Virginia Tech.